If you've got a baby on the way and are worried that parenting might be a little overwhelming, don't worry, there's now an app for that. 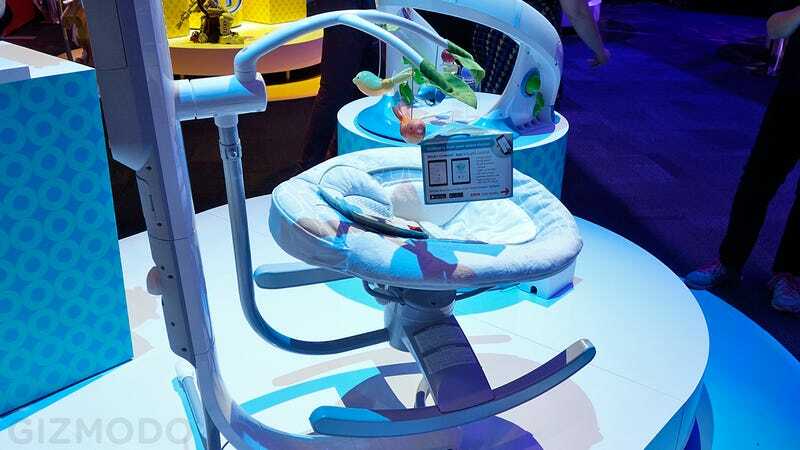 Fisher-Price's new 4-in-1 Smart Connect Cradle 'n Swing can be remotely operated from a smartphone or tablet using a free accompanying app, so you don't need to be anywhere near a restless infant to rock, soothe, or help put it to sleep. It sounds like a product more at home in a heartless dystopian future, but often times a baby is more inclined to cry when a parent is present, in hopes it will be picked up. And that doesn't help the situation when you're trying to get them to fall sleep at night. So the Smart Connect app lets parents remotely select one of the cradle's six different swing speeds, or choose between a side-to-side or head-to-toe motion, whichever seems to work best when calming a restless infant. Parents can also activate a hanging mobile that features three glowing birds overhead, play one of 16 kid-friendly songs with volume controls right on the app, or simply turn on one of three soft and soothing nature sounds to keep a baby interested/distracted.